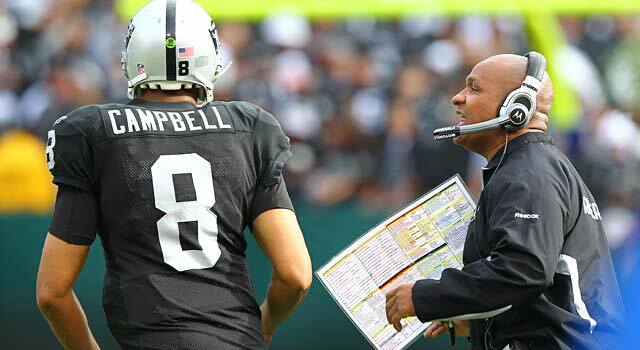 Published: Feb. 10, 2011 at 12:18 p.m.
One of the issues Hue Jackson faces as Oaklandâs new coach is seeing if Jason Campbell can be a reliable QB. 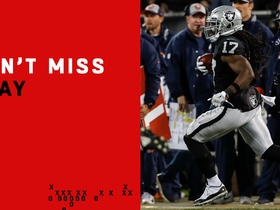 The Oakland Raiders don't enter this offseason as a punch line. It's the first time in a long time we can say that. This once-proud franchise finished the season 8-8 after drafting like it had a legitimate plan and operating as if there were a blueprint. Players played hard, but their performance was not always consistent. Still, things were better all the way around. The potential for the pendulum to swing back to its dubious direction is plausible. The Raiders fired coach Tom Cable, who seemed to restore some sense of order in the locker room. They also could lose their best player, cornerback Nnamdi Asomugha, after triggers in his contract made him a free agent. Conversely, Oakland could continue to improve. Cable's replacement, Hue Jackson, is a first-time head coach, but he's earned his way through the ranks and proven he's a strong offensive mind who has established a great rapport with players through his career. Jackson also has put together, to this point, the makings of a solid staff. 1. Can Jackson adjust to new role? Like a lot of assistants who become head coaches, Jackson will have to build a wall of sorts between him and his players. Jackson is a relationship builder and sustainer. Examples: He's helped high-maintenance players like T.J. Houshmandzadeh and Chad Ochocinco remain focused and productive. He also had dialogue with Michael Vick while the quarterback was in prison on dogfighting charges, helping a guy he really never had a chance to coach when he was offensive coordinator in Atlanta in 2007. As a head coach, Jackson can't get too close to players because he could be perceived by those he's not overly cool with as playing favorites or be deemed a turncoat when he has to hold those he's been cool with accountable. It's a tough balance, but Jackson really knows how to manage circumstances and should be able to make the transition. 2. Will Asomugha be back? While Asomugha said he wouldn't mind returning to Oakland, he's going to be at the top of the list of the free agents who could cash in, so his return seems less likely. Sure, Oakland could pony up, something it hasn't been afraid to do, especially when it comes to Asomugha. However, it could view him as a special player, but one who hasn't gotten them over the hump for the money it's paid him. He is coming off his least productive season. In turn, he could explore situations where he could finally find out what it's like to win. Last season's .500 mark was the first time in his eight-year career that he wasn't on a losing team in Oakland. It's hard not to envision corner-needy teams like Houston, Washington, Chicago, Philadelphia and Baltimore not being interested. If the Raiders lose Asomugha, they'll be in the market for another corner. Whoever is among the fastest at the upcoming NFL Scouting Combine could be wearing Silver and Black whenever the season starts. 3. Would Asomugha be biggest loss? In terms of talent and impact on the opposing team's passing game, yes. As far as attitude and leadership, maybe not. Defensive end/tackle Richard Seymour -- coming off a Pro Bowl season -- also is a free agent and losing him could hurt. After being traded from New England, Seymour eventually bought in and showed a lot of players what it takes to win in terms of work ethic, production and trusting the coaching staff. Seymour said he's open to returning to Oakland and, at 31, the Raiders could be his best option. 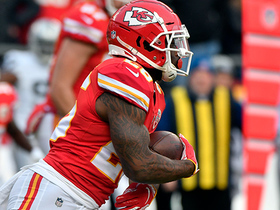 While there's been speculation about Seymour getting the franchise tag again, he has yet to be informed of any such decision. Coaches for successful teams will tell you that they try to have a veteran leader at every position group to lead meetings and to set the tone in practice, even if those vets aren't the best player at that position. Having someone who has won before in the locker room is huge, especially for a team that's perpetually in transition like the Raiders. 4. 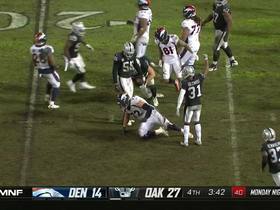 Will Raiders stray from running game? Jackson was the guy calling most of those running plays, so it's unlikely he'll divert from his baseline too much. 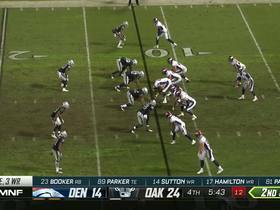 Cable was a big run-first guy, though, so we'll see if Jackson was calling plays based on Cable's directive or if he knew that running the ball with Darren McFadden was best. Oakland could lose backup tailback Michael Bush to free agency and he's been a pretty solid player. While he can be replaced, the Raiders better have a solid second option with McFadden's injury history. FB Marcel Reece is a highly underrated threat in the passing game. 5. Can Jackson get most out of Campbell? Getting the most out of quarterback Jason Campbell is a relative term because, even after six seasons, we still don't completely know what he's capable of doing. What we do know is that he can throw the ball downfield and Oakland has some vertical threats in Jacoby Ford, Louis Murphy and Darrius Heyward-Bey. Chaz Schilens is also reliable when healthy. Ford is the type of game-breaker that can take a short pass and go the distance. If the offensive line improves, Campbell could have one of his best seasons in a play-action based system. We'll see if he can remain the starter ahead of Bruce Gradkowski. Cable was committed to him but didn't see the consistency that he wanted. Committing to a quarterback and him earning that commitment are two different things.